Excite and Explore | One mom, one toddler and a passion for learning and adventure. 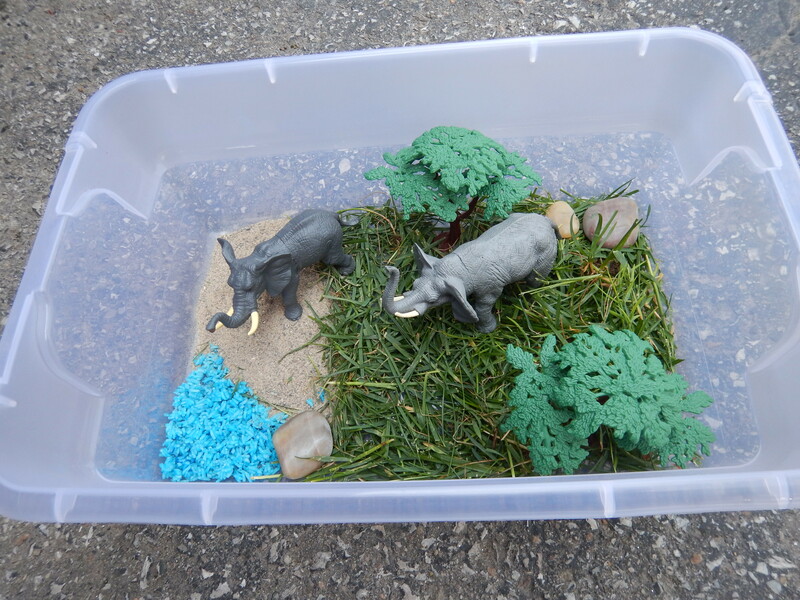 The weather is beautiful and we felt like celebrating the start of summer with some sensory play. 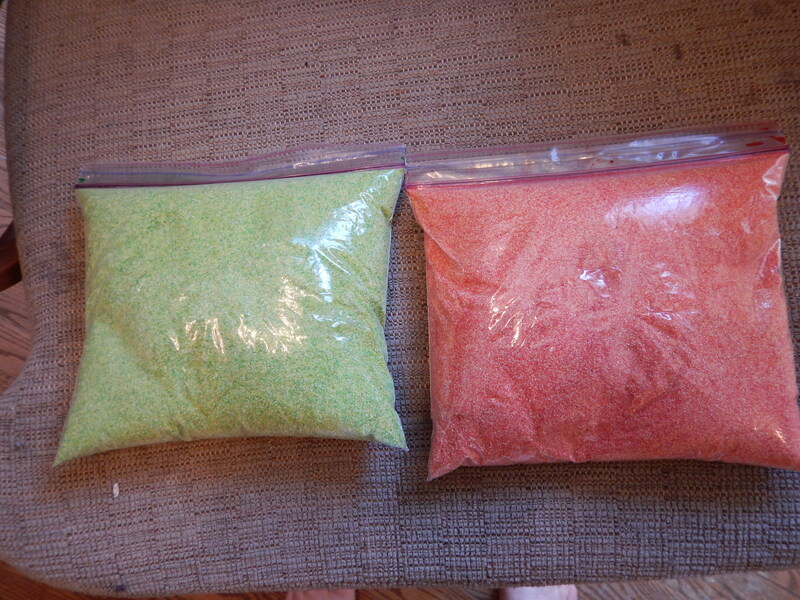 I recently saw this awesome post on Blog Me Mom with this amazing Edible Sand Recipe and knew we had to try it! I just want to take a minute to rave about this recipe, it is incredibly simple, smells amazing, and feel just like sand while at the same time being edible so it is perfect for little ones who like to put whatever they touch in their mouths. 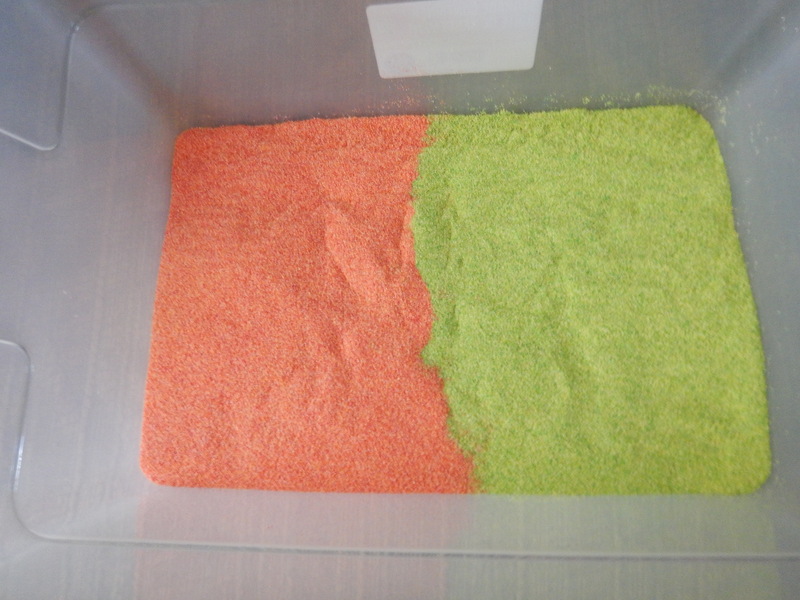 We whipped up a small batch in green and pink, which Gray loved helping to make. Then we put it away until after nap time, because he was getting a little worn out. 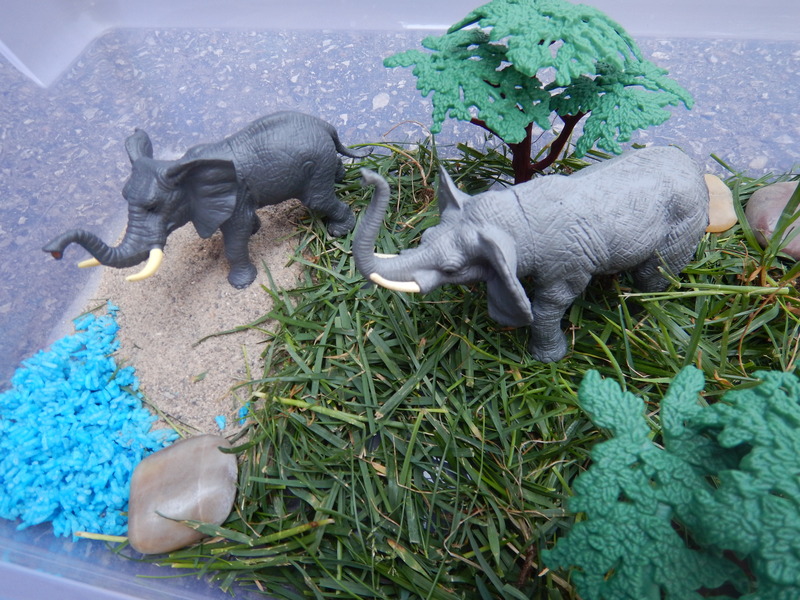 While he was asleep I added some luau flowers, sea shells and a little plastic beach shovel and it was ready for play! I set it up on top of a plastic picnic table cover for easy clean up and when he woke up I put out the little bin. He plucked up the shovel. 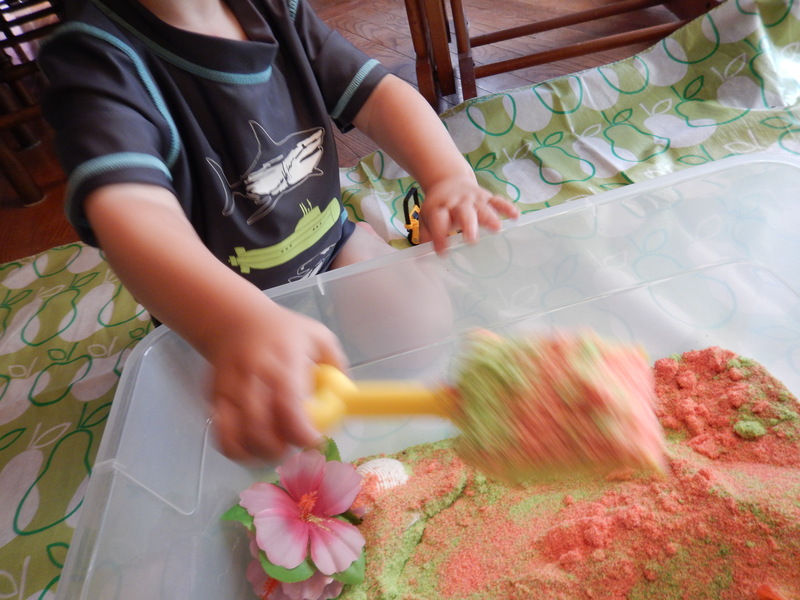 My son has always been a bit reluctant with sensory play until he has had some time to poke and prod at the base material with a scoop or shovel, but once he is used to the idea he usually dives in. 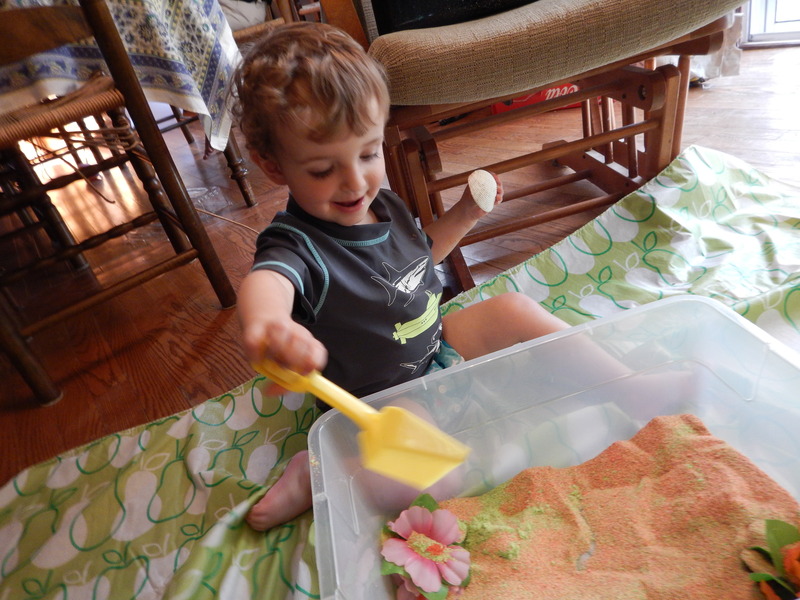 He had a great time scooping sand with the shovel and shells and just mixing it around in his hands, and I think in the future we will have to make a bugger version of this recipe for more play. 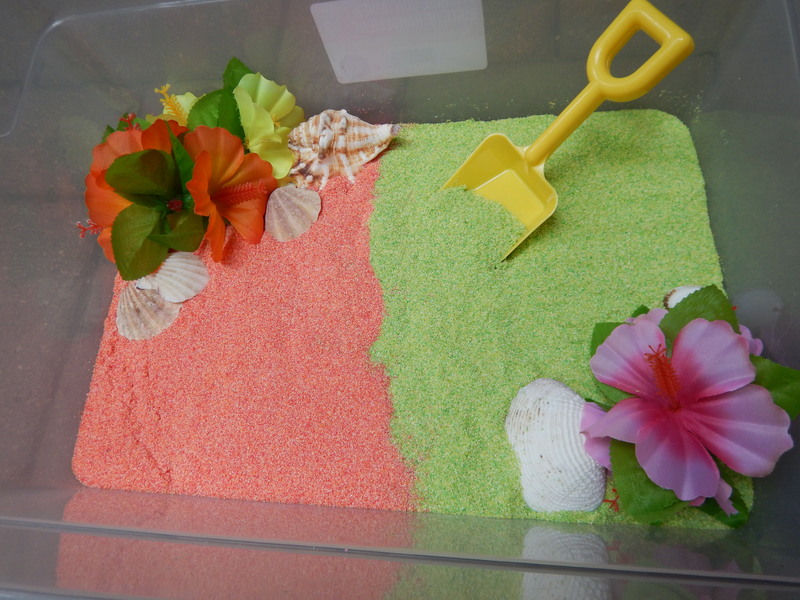 Categories: Sensory Exploration | Tags: luau, sensory play | Permalink. I’m going to be honest, we have been in a bit of a rut at our house. I seem to find myself stuck with a bored toddler and not a clue what to do next, which is a bit unusual for me, there always seems to be something new to try. Keeping your child occupied isn’t always easy, and you don’t always have time to run out to the store and pick up materials to put together an activity, so with some help from my fellow bloggers I have compiled a short list of fun activities that you can do with your child, using things you (probably) already have lying around or stored in the back of the cupboard, that will keep your little one entertained! Kids love water, it is a fact, and nothing pleases them more than splashing around, especially on a hot day, so why not add some bubbles to the mix? Trust me, the simple things are often the most beloved! Find out how at the link! If you didn’t notice my enthusiasm for bubbles in the first post let me re state this, kids LOVE bubbles, and they are easy entertainment, so why not try making your own Homemade Bubble Blower! This looks like so much fun, and is super simple, we will be trying this later this afternoon, as we are big bubble fans in our house and these look really easy for a small child. 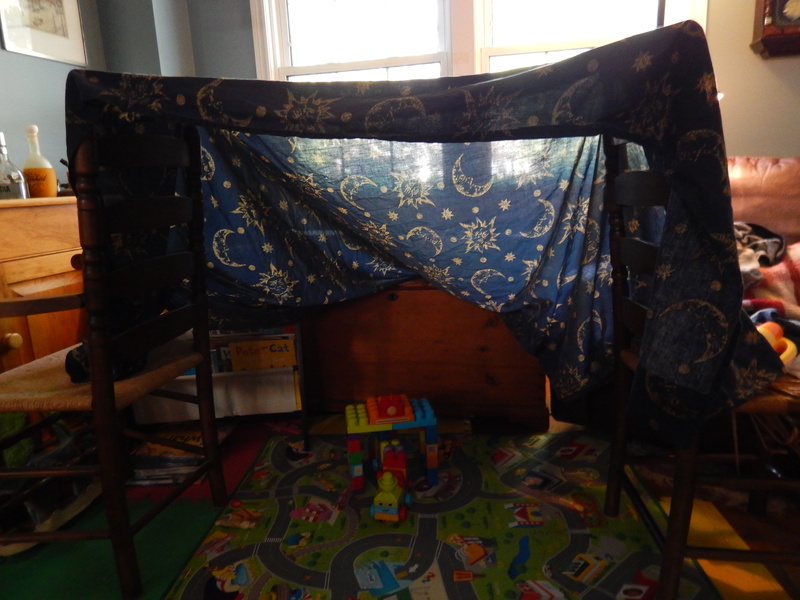 Yesterday we were in the midst of wandering around our living room aimlessly, still stuck in the aforesaid rut, when I thought back to what I liked to do as a child, and topping that list was making a fort. Forts don’t need to be complicated, or fancy and you don’t need any special fort making kits or materials, it can be as simple as two chairs and a blanket. We happen to have the perfect fort making chairs, they have very tall backs that are just begging to have a blanket draped over them, sometimes secured with an elastic over the tip of the knobs. I am a bit ashamed to admit that since having my son, who recently turned two we have not actually made one until the inspiration hit yesterday, and soon he was running in and out of his “fot” (yes, it sounded like fart) waving his arms in the air and giggling. But what about babies I’m sure you’re asking, well fear not, we have some simple fun for them as well! 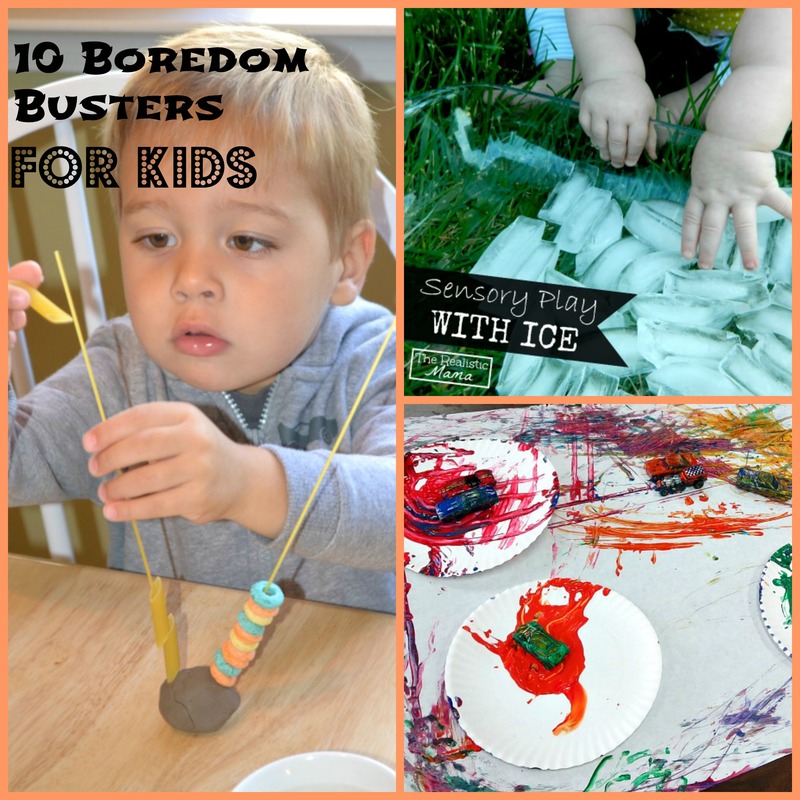 We love this idea from The Realistic Mama about using ice as a sensory experience, check it out! What kid doesn’t love plains and trains, because mine sure does! This craft looks so cute, and it uses toilet paper rolls and egg cartons, which I stockpile in the house like a kid stockpiles broken crayons, because there is always some cool use for them! Follow the link to find out how to make your own cool craft! Water, water, water. You may feel like I am being a bit repetitive but water is easy to access and easy to clean up after, so check out this fun set up using things you can find around your house (except maybe the water beads) that will pass the time away a fill it with big smiles. Plus, it is summer and some days you need some water play in order to cool them down. Cars are like currency to children, they treasure them as we treasure that no fat, extra foam latte. Okay, maybe not but it is something found in pretty well every house hold. This fun activity uses them as an art medium, bringing new fun to the table (and possibly all over your walls) and we will be doing this tomorrow when he gets a bit restless. Pasta is a staple in a lot of households, but it is for more than cooking! 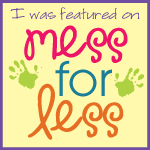 Check out the fun they had over at Mamas Like Me with their spaghetti! Need to keep the baby brother or sister occupied while your toddler tries out that Homemade Bubble Blower? 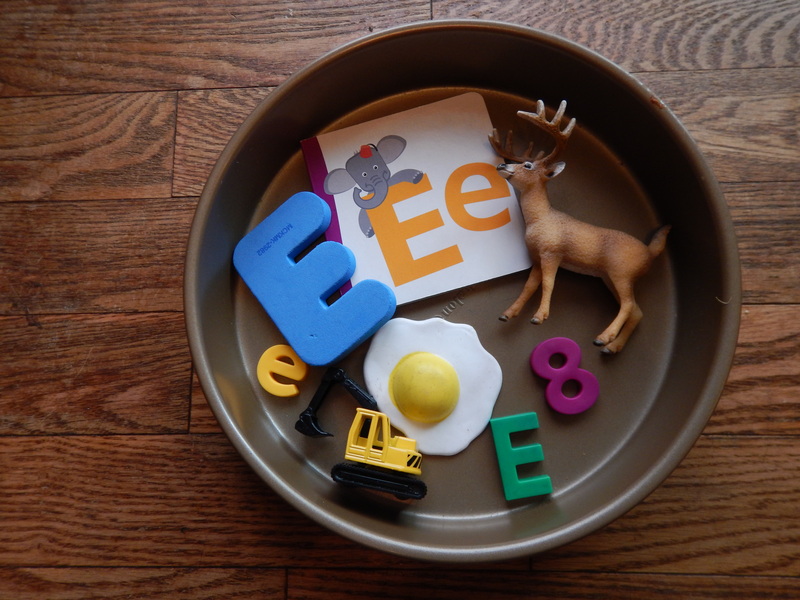 This activity is perfect for the young baby who hasn’t quite grasped the concept of the shape sorter, and it is something you can easily put together, check it out! Well I don’t know about you but I’m feeling pretty inspired right now, and I’ve already pulled out some stacking cups for when the toddler wakes up from his nap. I hope this might help you find some fun activities for you and your kids, thank you for joining us at Excite and Explore! 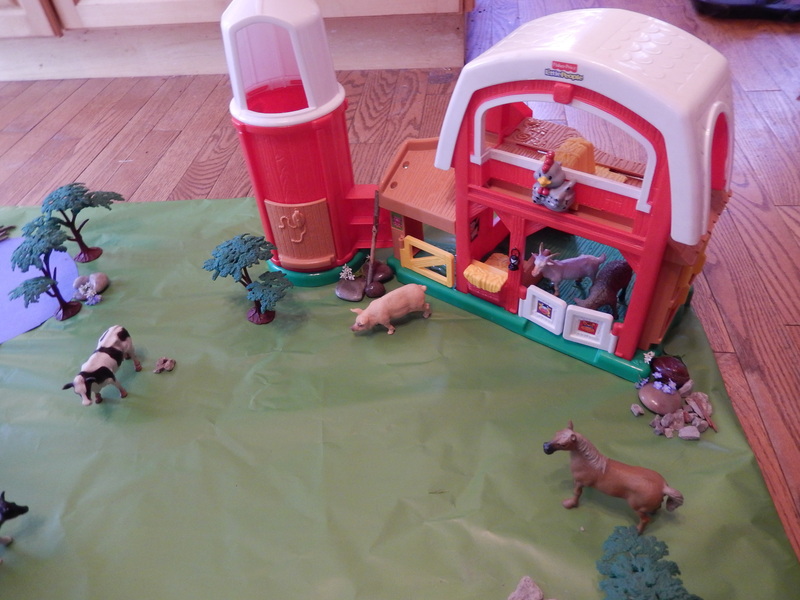 Categories: Fun at Home | Tags: toddler activities | Permalink. Welcome to another letter of the week! 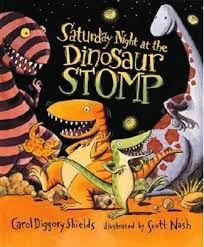 This week we will be learning about the letter D, and I will be sharing a fun toddler activity for the letter D, the Dinosaur Lagoon! 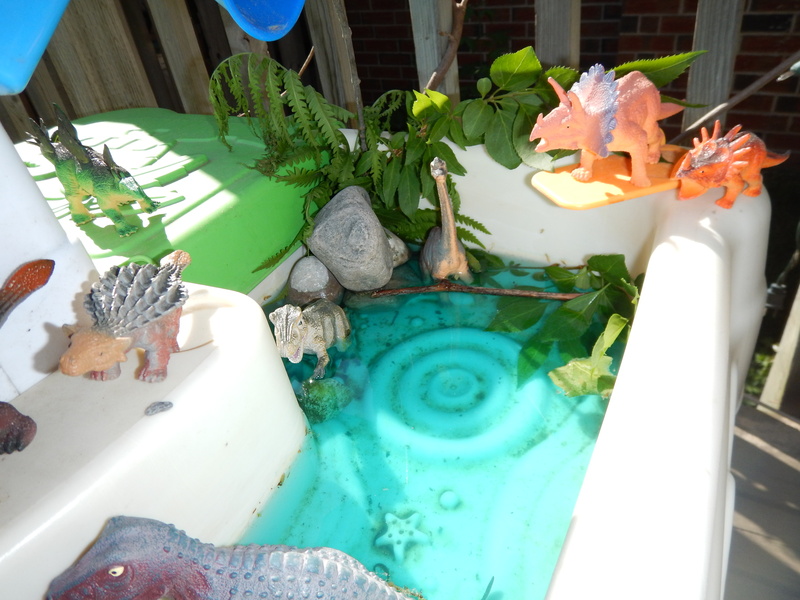 Since the weather is so lovely we are always looking for ways to cool down outdoors, and thus the dinosaur lagoon was born! 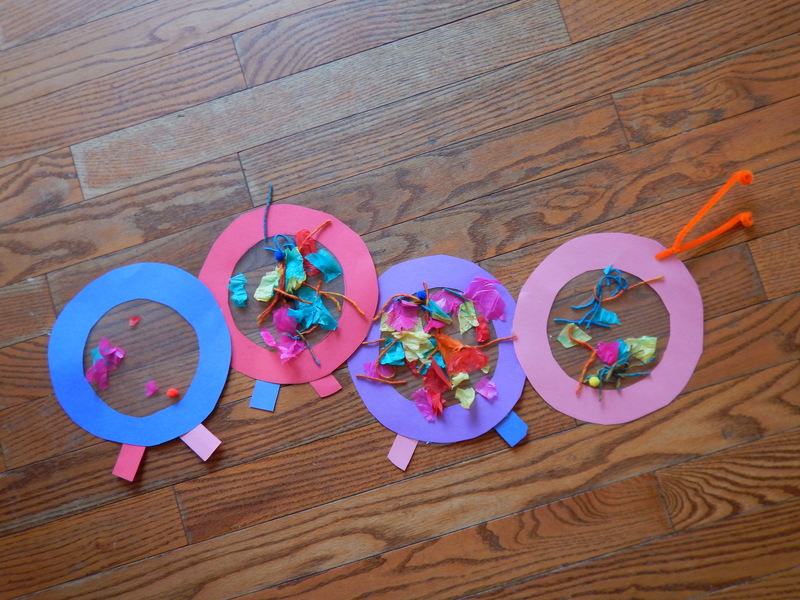 It is fairly simple to make, and has provided us with hours of fun for my little one. 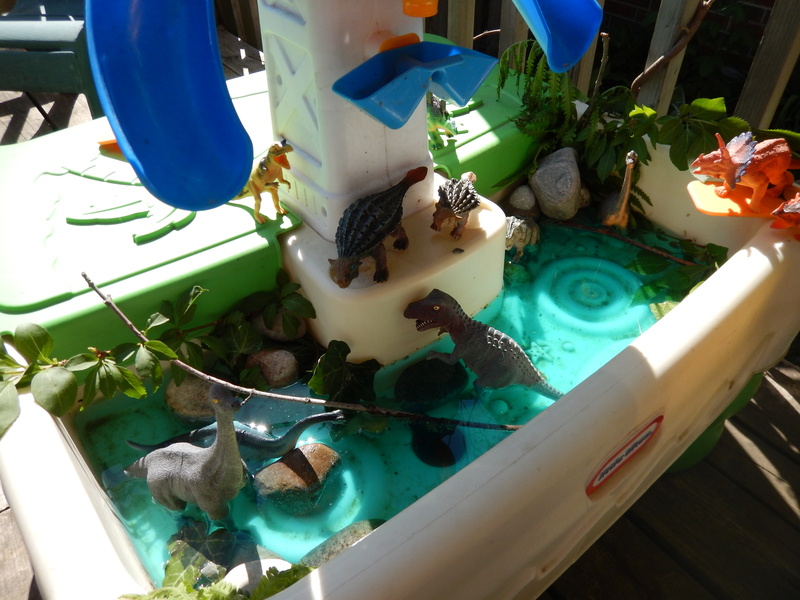 I filled up our water table with a shallow layer of water (If you use to much water the dinosaurs will float) in one half, and added a few drops of food colouring spread out around the water and mixed it in. Then I took some leaves and rocks from around the yard and placed them around our lagoon, wedging the sticks and some branches from bushes into the rocks so they seemed to sprout upwards. 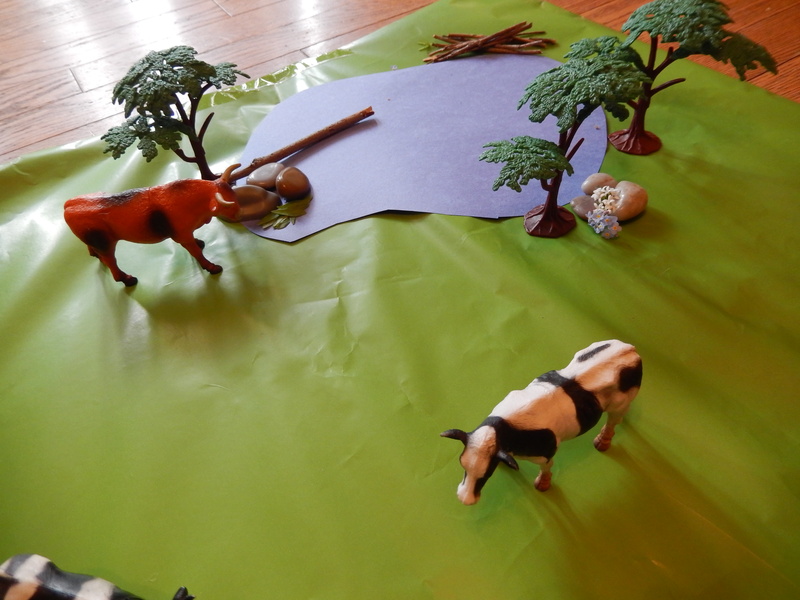 Last came the dinosaurs which were set up around the marsh and it was ready for play, see easy peasy! I stripped the little man to his diaper, since the water is coloured with food colouring it may satin clothes, and when he plays in the water table very little water is left in the table by the end. 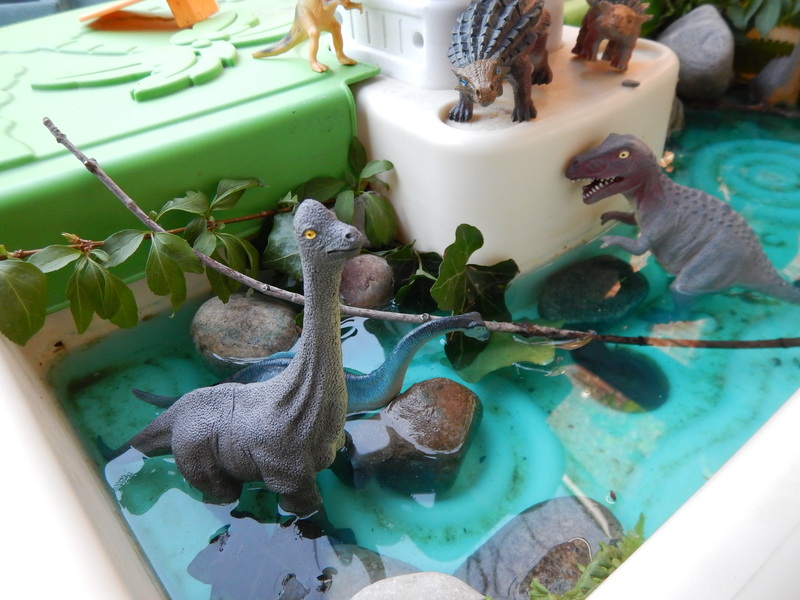 I hope you enjoyed our dinosaur lagoon, thank you for joining us at Excite and Explore! Categories: Fresh Air Fun, Lets Use Our Imagination | Permalink. 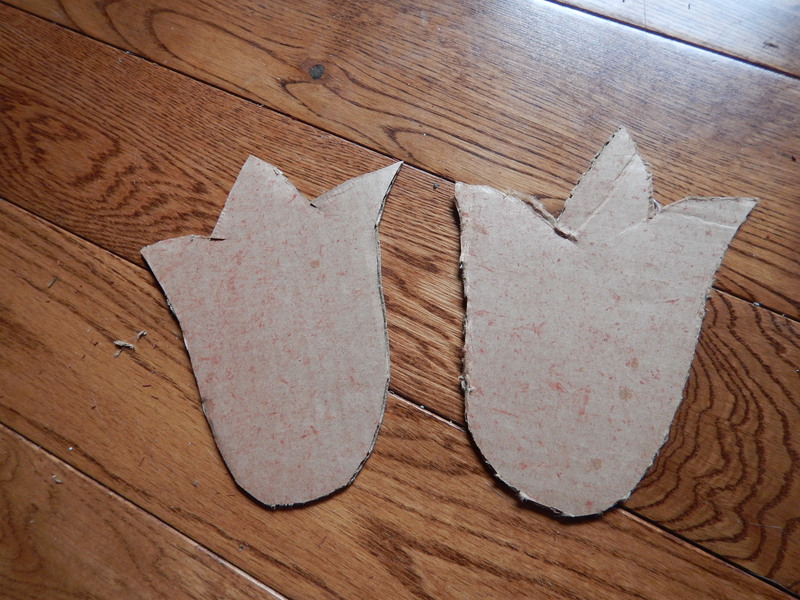 We started by drawing our version of some dinosaur feet on some old cardboard I found laying around. I cut it out with scissors and it was time to paint. 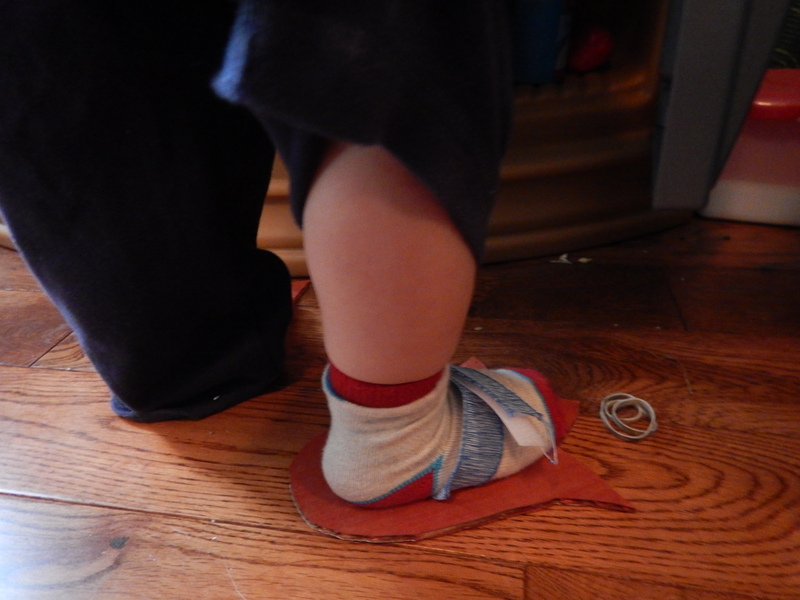 I made them fairly small so that my little guy could easily stomp around in them without tripping all over the place. 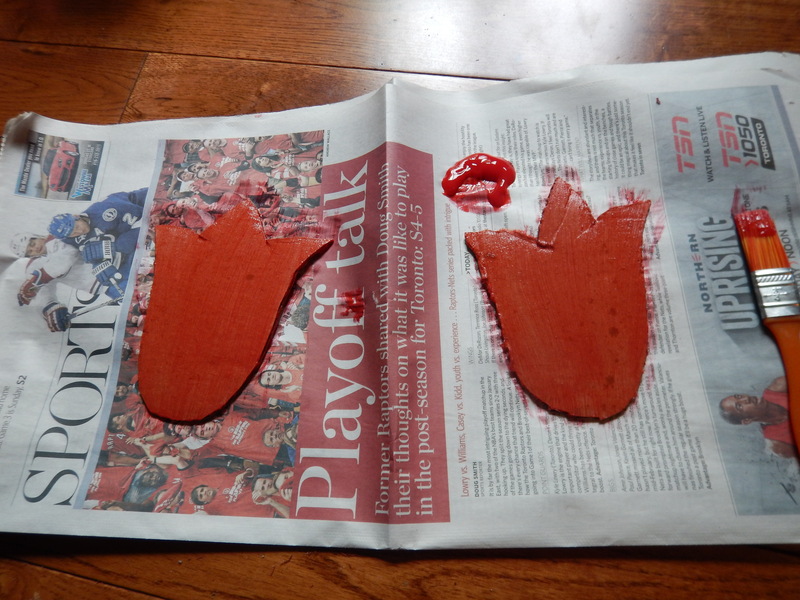 We painted on some red paint and let it dry before adding another coat to brighten up the colour. Next I brought out some ribbon and cut a two small holes in the sides of the heel area, threading it through the bottom so both ends came out on top. Then I added some Velcro strips to the ribbon to secure it to the foot, putting the scratchy strip facing upwards so it wouldn’t irritate his foot. Then they were ready for play! I secured them to the little mans feet and put on some music. 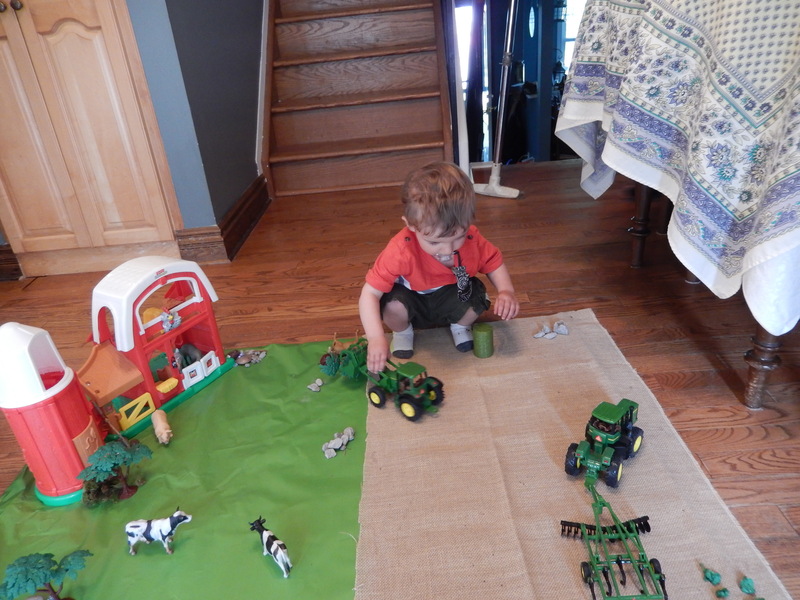 He took a few test steps and soon was stomping all over the living room while giggling away. 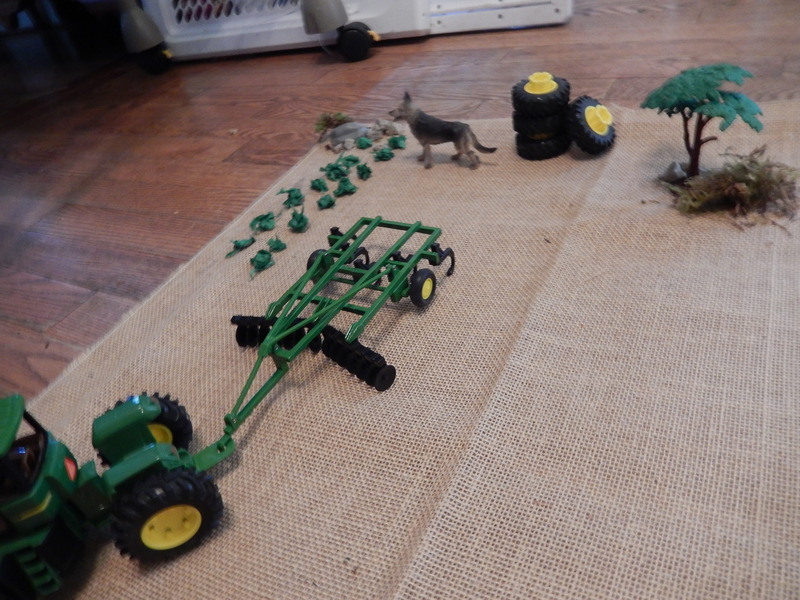 Categories: Fun at Home | Tags: Craft, dinosaurs, Toddler Activity | Permalink. 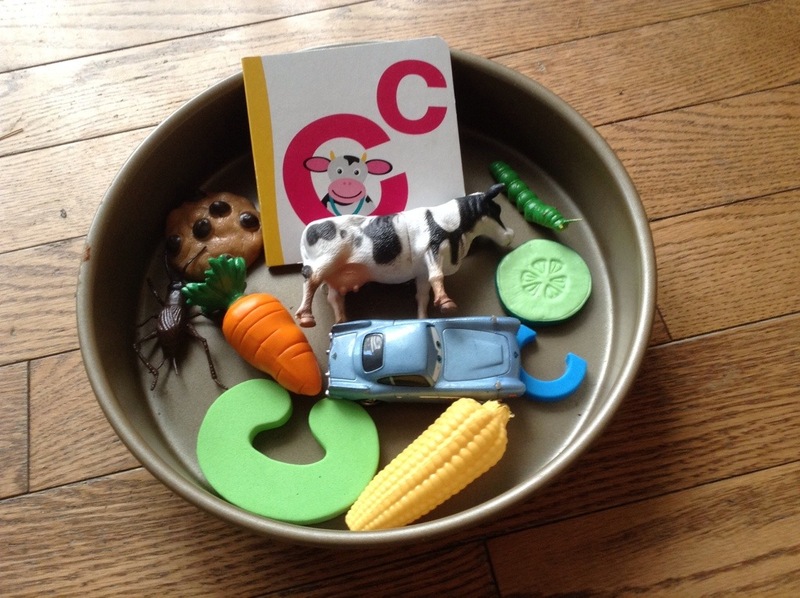 Today we worked on learning the alphabet, and today we learned about the letter C. We started off with our usual pie tin bin full of things that start with the letter C. We had a cow, a cricket, corn on the cob, cucumbers, a caterpillar, a car, a carrot and a cookie to explore, as well as our Letter C book. 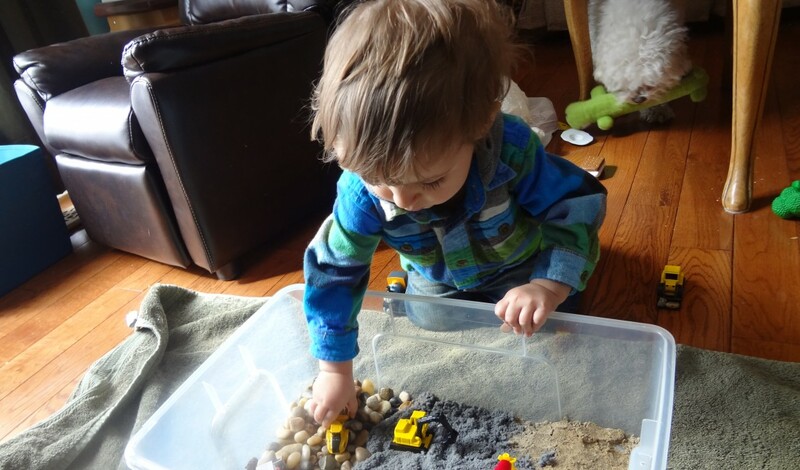 I really love these little bins, they really go over well with the little man. 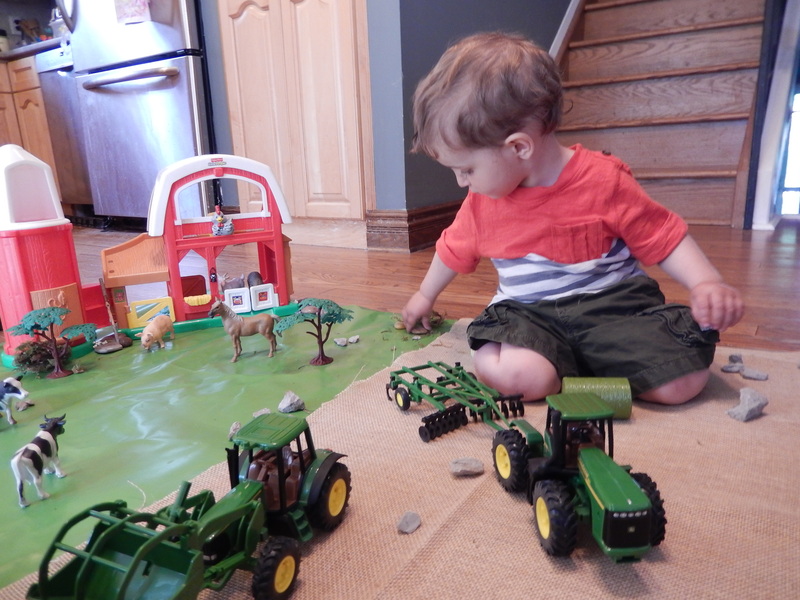 He always dutifully explores the different objects as I chat away about the letter we are learning about, and playing with the toys. As you all know I do the majority of my prep while he naps, and today was no different. 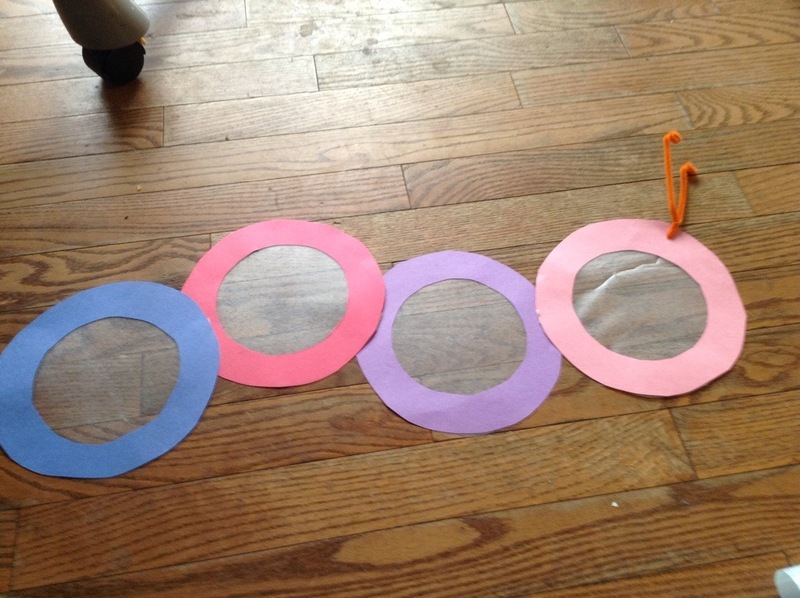 We did a caterpillar craft, using some simple materials and a bit of imagination. 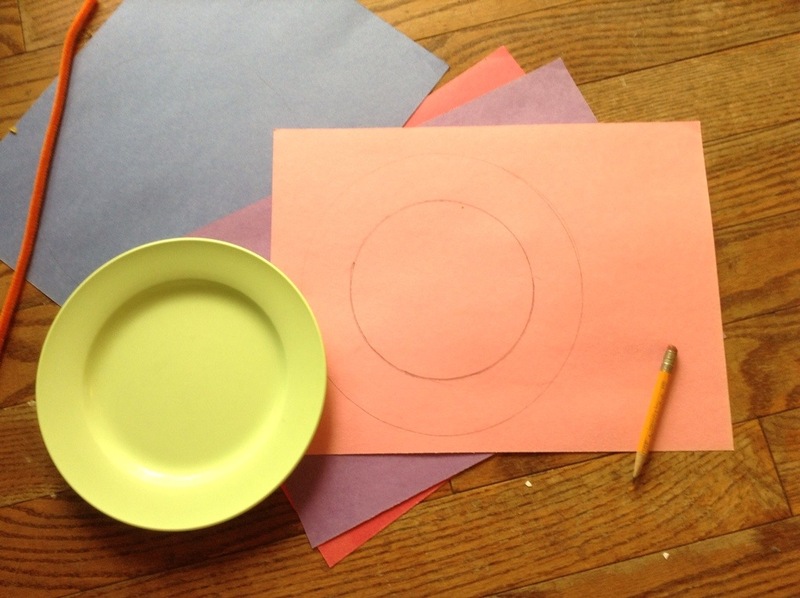 You will need some construction paper, tape, a pencil, contact paper, scissors, a small plate and a pipe cleaner, all in the colours of your choice. 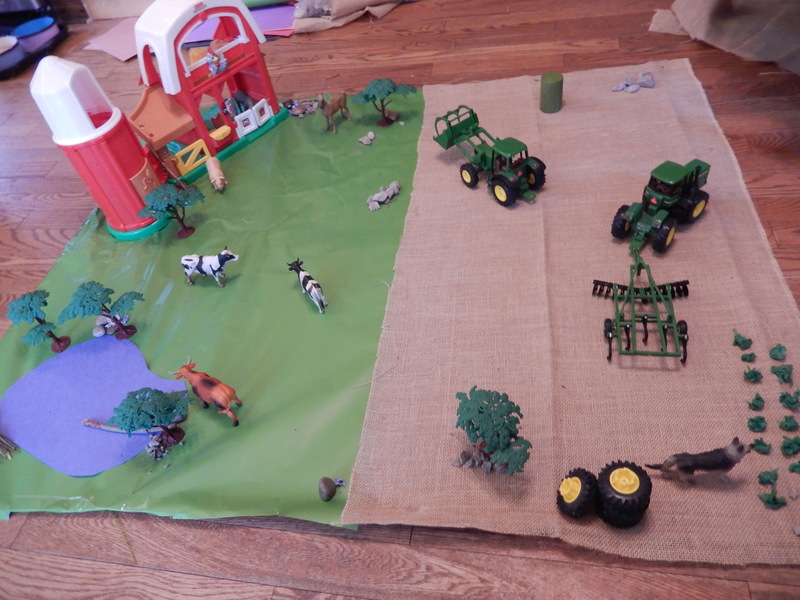 This is a great craft for young toddlers because all they have to do is stick on the pieces, it is a bit off a collage, and my little one isn’t interested in much more than this at his age. 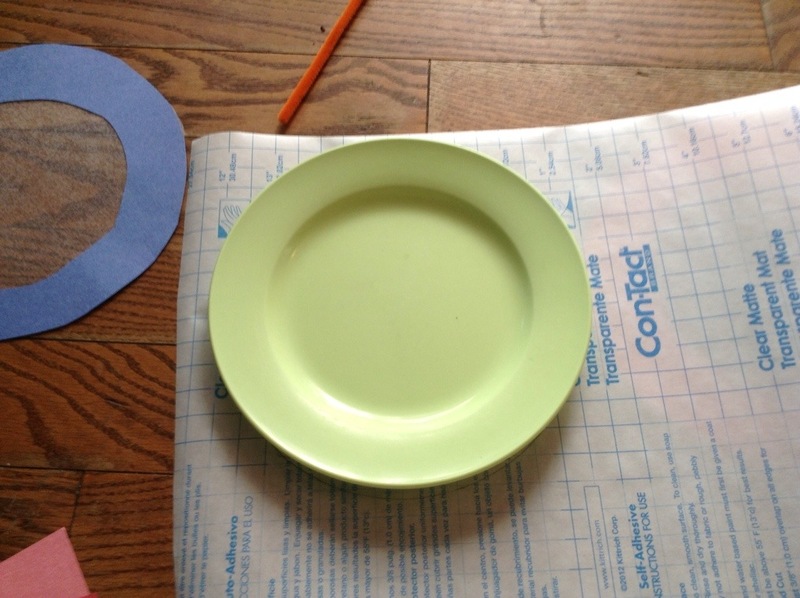 Take your plate and use it as a stencil, tracing a circle onto each piece of construction paper, this will be making up the caterpillars body, use as many as you like, we used four. I then used the inside rim of the plate to trace a smaller circle on the inside and cut it out so it looked like a zero. 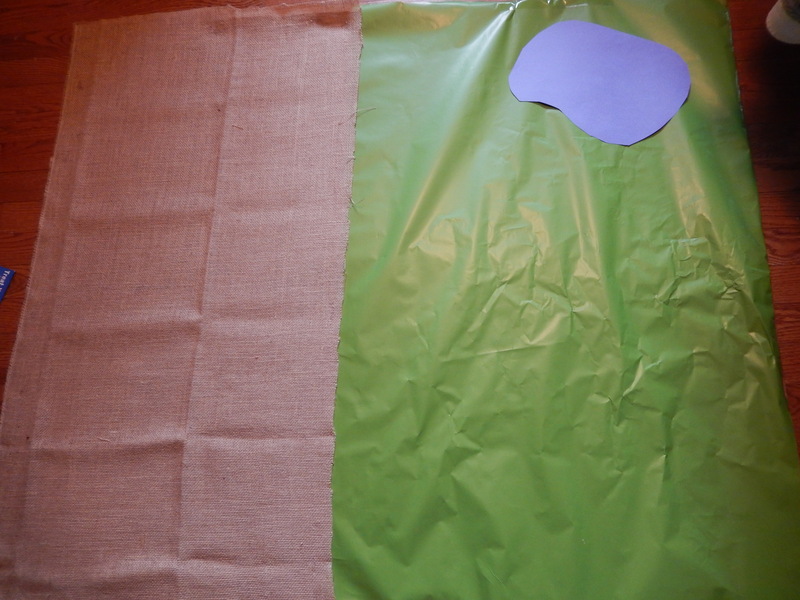 Then use your plate to cut out as many circles of contact paper as you have body pieces. You still with me? Peel off the protective side of the contact paper circle and stick it onto the circle made out of construction paper, sticky side facing up. If you are confused here is your caterpillars body. Do this for all of your caterpillar so you have as many sticky surfaces as you have pieces of body. 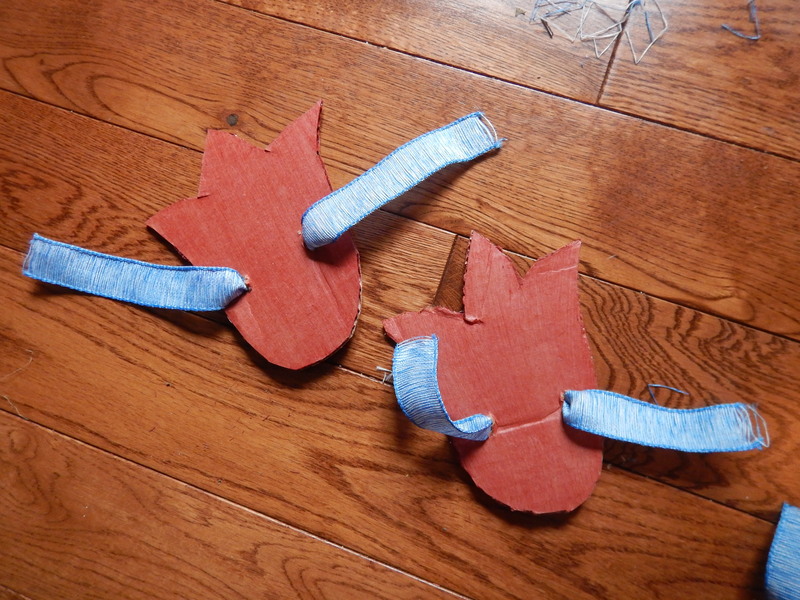 Stick them all together with tape or glue and add some legs with your scraps. Thread the pipe cleaner through the top of the head, I curled the antennae by wrapping them around a pencil and your caterpillar is ready to be decorated! What you use to do this is completely up to you! I put some ripped up tissue paper, tiny pom poms and snipped up pieces of colourful yarn in a bowl and simply placed it on the floor beside the caterpillar. Once the little man came down he wandered over after some cuddles and I showed him that he could stick the colourful scraps to the caterpillar and he dove right in, taking whole fistfuls and mashing them into the sticky contact paper. I’m afraid my camera took a tumble at this point in the process (yikes! Any one know how to fix a lens error? ) and is out of commission but later in the day I pulled out an old one and took a picture of his finished product. Next week we will be moving on to the letter D, we would love to hear your ideas and thank you for joining us at Excite and Explore! Categories: Creative Crafts, Learning The Alphabet | Tags: Learning Alphabet, Letter C, teaching toddlers | Permalink.